The fantastic – and sometimes overdone – customs built by Spohn in the postwar years have captivated my attention for many a moon. And I pine and wish that maybe…just maybe…someday I will find a neglected or forgotten about Spohn Custom that I can take home and make my very own. I think good friend Rick D’Louhy fears that same day, but I continue my quest for “all things Spohn” during our research on the early postwar years of sports and custom cars in America. Recently, thanks to the efforts of good friend Glenn Brummer, I came across two 8×10 glossies taken at the 1957 Indianapolis Custom Car Show that featured the Lee Hartung Spohn Custom car. 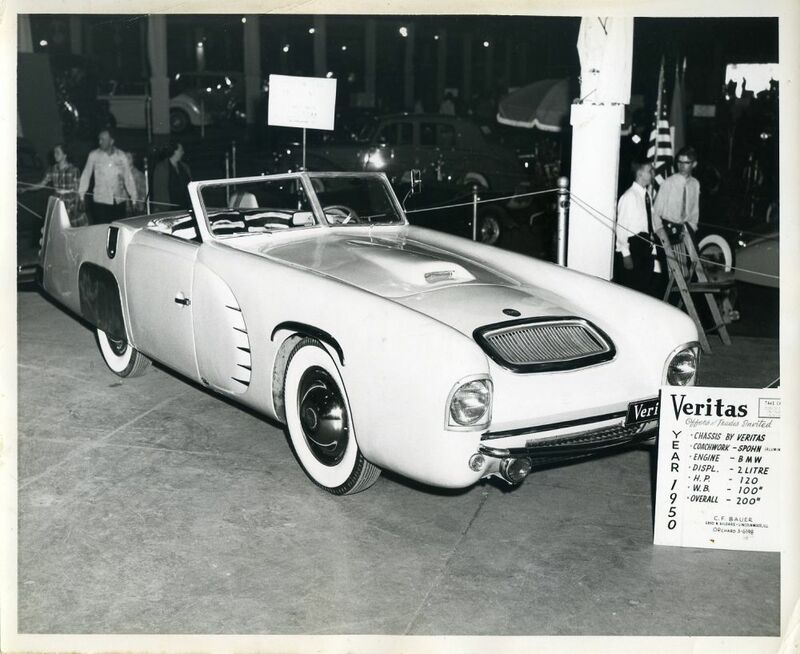 During the show in 1957, the Veritas Spohn was not just on display but for sale/trade as well. And…it displayed some nifty specs on the showcard placed in front of the car. Let’s check out the photos and see what we can see. And remember…click on the photos below to make them larger on your screen. So now we have a new owner name for 1957 – C.F. Bauer from Lincolnwood, Illinois – that we can add to the list for this car. Perhaps he was an owner or maybe acting as the agent for a trade for this car. 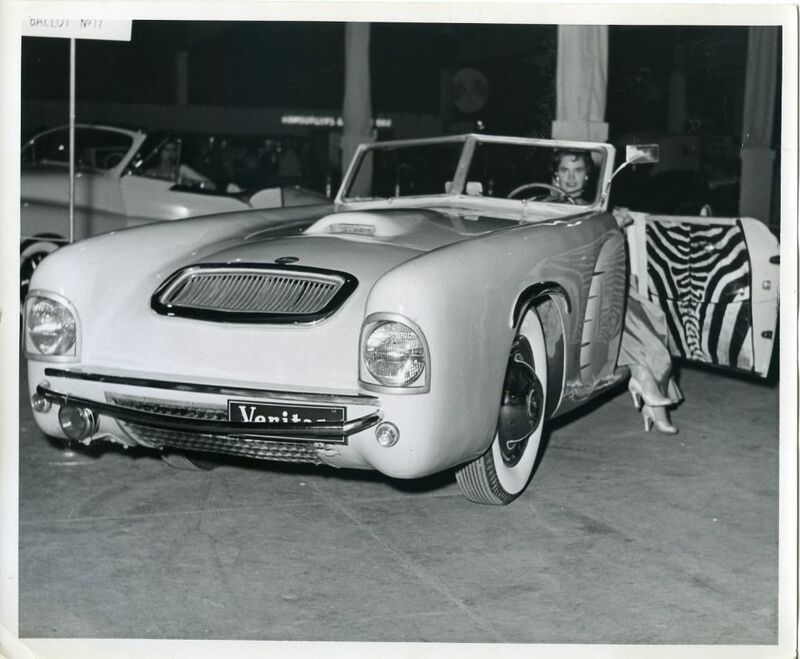 It’s neat to see that the car was being shown as a “Veritas” with a body by Spohn. And…the year shown for the car is “1950.” All good points of data when researching the history of special cars like this. And check out that zebra-skin interior. Talk about period correct! What a stir this car must have caused everywhere it went. And by the way, this very car was displayed with our car – the 1962 Shark Roadster – at the 2013 Amelia Island Concours d’Elegance just a few weeks ago. Click here to review the Spohn and some of the other cars shown with this car as posted by our friends at Hooniverse this past weekend. Let’s see what our resident Spohn expert, Wayne Graefen, has to say. He may have already located more information about this car as well, and his research abilities are top notch in every way. Wayne….what say you? The original owner of the car (possibly Mr. Bauer was 2nd) was a USAF pilot friend of Lieutenant Arthur Cooper who owned the 1941 Packard Spohn Custom. 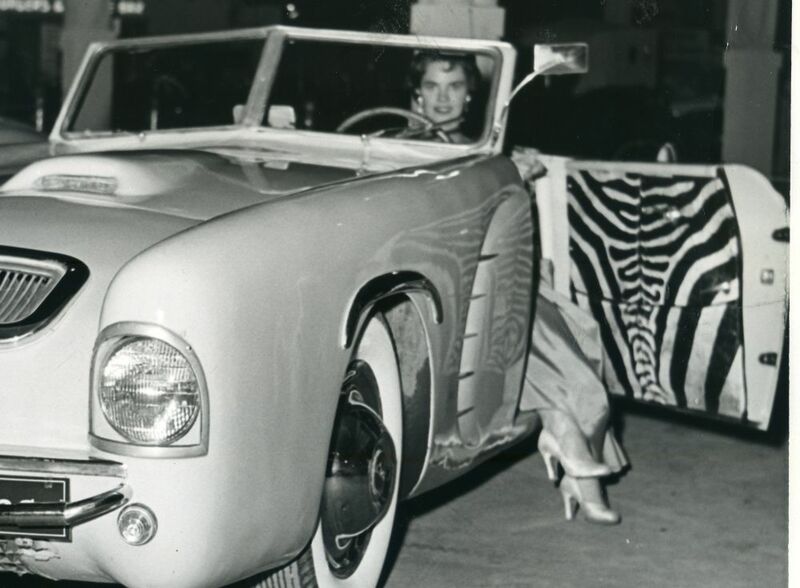 The two of them went on R&R to Africa on safari and brought back the zebra skins that were then employed by the Spohn Carosserie in the construction of this car. Mr. Cooper is still living. His Packard is under restoration in Australia. It’s really strange that I never saw this car until Lee Hartung had it in his museum. When I lived in Skokie, IL (right next door to Lincolnwood, IL) I used to spend hours, nearly every day, watching cars go by at the intersection of Toughy Ave. and N. Cicero Ave. sitting on top of a stop light switch gear box. Then, in 1956, our family moved to Indianapolis, IN where the car was shown at the Auto Show in 1957 and I didn’t see it then either! I must have been out at the Indianapolis Motor Speedway during the month of may. In any event, it’s a very interesting car and I’m glad that I could help find another piece of the history puzzle. Now, we still need to find out if the car was built for the TV series of “Boston Blackie”. Very glad you found these pictures from Indy! Yes, every clue helps the larger mysteries around postwar Spohn. It took a lot of searching but I did find that the Boston Blackie car was in fact a customized Crosley. The story that this Veritas, or the second Veritas Spohn Custom may have been used in the TV show is, as far as I am concerned, strictly a mistaken identity or a rumor. I have some photos of Blackie’s Crosley and I’ll post them at my Spohn Custom Enthusiast’s page on Facebook. Wayne – There were a considerable number of different custom cars used in the filming of the Boston Blackie TV series. I have copies of 6 – 8 episodes and there are 3 – 4 different customs in those films. The only reason I bring up the ’50 Spohn Veritas being used by Boston Blackie is that Lee Hartung told me that he had been told that it was used in one or more episodes. I think that the custom Crosley you refer to was built by Powell Crosley for use by Boston Blackie and now resides in a museum in Ohio. Okay, great, I was only finding the one Crosley as used. Others could then still include the Veritas. Can you identify any of the others from the episodes, Glenn? Well, yes and no – One of the cars, which I have pictures of, Geoff has asked me not to talk about because he has his eye on that car. 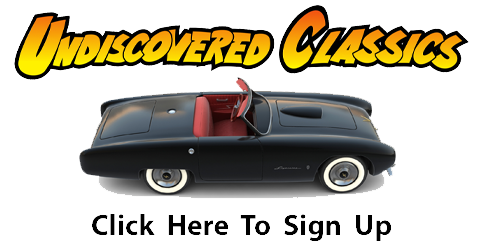 Another car can be found if you Google Boston Blackie TV Custom cars – it shows a dark colored two-passenger roadster with a center tail fin – not very pretty. They say that it’s either a custom Muntz Jet or a custom Crosley – I don’t think that it’s either one. I have some pics of the custom Crosley. In another one of the episodes, Kent Taylor (Boston Blackie) is driving a low slung two-passenger roadster – I have no idea what it is/was. I’ll try to re-watch some of the videos and see if we can stop the picture long enough to snap some digital photos – I think that we can do that, but I’m not certain. Thanks Glenn. Agree the finned car in B&W pics is not the same car as the red Crosley in Ohio. And the fin is probably not on a Crosley. Only other car I can find in photo said to possibly relate to Blackie is a ’40 era Willys sport custom roadster in the Mechanics Illustrated rebuild style. That car I actually personally saw in a salvage yard in Alamogordo, New Mexico some 25 years ago. Screen captures would be fascinating! Art Cooper and his Airforce buddy went to northern Africa for a holliday, apparently as they did on more than one occassion on hunting parties, using Airforce aircraft for transport to and from. On one particular occasion they sought out and bagged enough zebra to upholster the Veritas you have shown me. Well done, very exciting. The zebra was brought back while the Veritas was in the Spohn works having its modifications. Cooper also advised that he was in partnership with owning this vehicle. They had the Spohn work done on the car after accidentally damaging it when it ran off the road, rolling it into a ditch. I can’t remember if he advised me of his co-owner’s name, but I guess that Bauer would be a good start. Cooper said he sold his share to the other partner when he or they returned to the US as he didn’t need two Spohn customs. At the time he advised me of all this I already knew of the existence of the Veritas in Hartung’s collection, and advised him of that fact. AC was very surprised that it still existed. Jim’s contact with AC was around a decade ago but he is believed still living and I will attempt to find and contact him. Art Cooper is probably the only person who ever had two postwar Customs built by Spohn and owned them concurrently, though briefly. The ’41 Packard has a photo album and comments at my Spohn Custom Enthusiasts page on Facebook. Some internet servers won’t allow non-FB members to view postings but most will. This strange little car never ceases amaze me. I can never really find the information on its origin that I would like. Please correct me if I am wrong. The car originally was a Veritas Scorpian sports car with a Spohn built body. I understand Spohn built most of the Veritas sports car bodies. That crazy vent near the door is the original Scorpian design. Why would anyone want to ruin such a pleasing shape with such an idiotic front and such a home made looking rear.Was it really the work of Mr. Spohn or some local crazy bodyman? I believe there is a lot we dont know about this car. 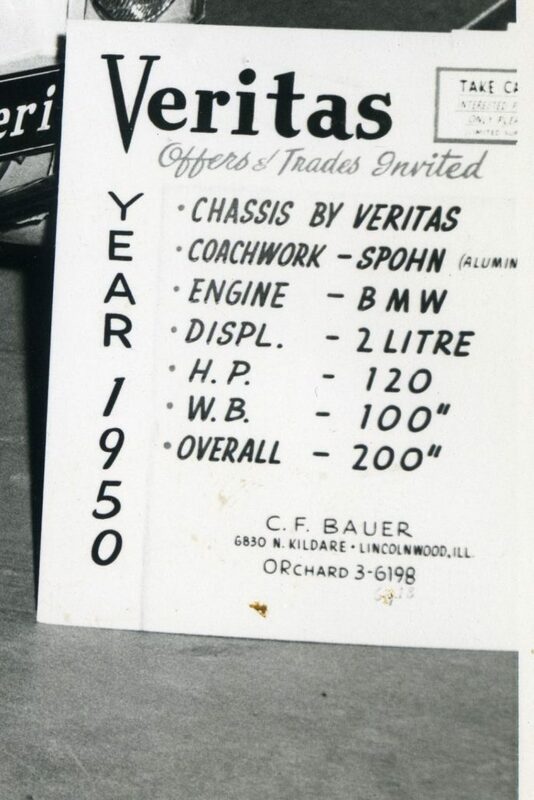 Yes, when new, the car was a “production” Veritas with coachwork by Spohn. These were racing cars and this car raced but was in a serious roll over accident off the track into a ditch which destroyed the first body and supporting structure. Two USAF pilots purchased the wreck and took it back to Spohn. One of these men was Captain Arthur S. Cooper who gave this story to the current owner of his other Spohn Custom, a ’41 Packard. The co-owner may have been Mr. Bauer noted on the sign or Bauer is second owner. All postwar Spohn coachbuilding is to the car owner’s design specifications. The cars current configuration was the desire of the two USAF pilots. Current research suggests that Mr. Cooper passed away January of ’13. Guys you have just got to read this (unless you all ready have). I have started doing some more research on this Veritas Spohn custom and have found this. Look up Ultimatecarpage.com A heading of Veritas 49 a letter by “novice” dated 26-10-2004. Does one have to be a member to search and come up with the 2004 post? I’m not finding it. Can you “cut and paste” it into another post here? Thanks. An Erwin Bauer, a Veritas race car driver, was killed at the Nurburgring on 3-6-58 any connection? As the Spohn Karosseriebau closed their doors in mid 1957, this would have no connection.